Dromore and District Male Voice Choir have been preparing for their 59th annual concert which will take place in Dromore High School. They wwill be under their musical director David Thompson and accompanied by Mrs Gertie Jameson on Friday 18th March at 8pm. Introducing the artists will be “The Wee Man from the Moy”, Ian Coulter, who served his apprenticeship in the Young Farmers Clubs of Ulster spinning yarns and developing his quick fire Northern Ireland humour which has made him so popular with Ulster audiences. As well as his many compering engagements throughout the province in venues such as the Waterfront Hall, Ian treads the boards regularly with Killyman Players in their Sam Cree productions. 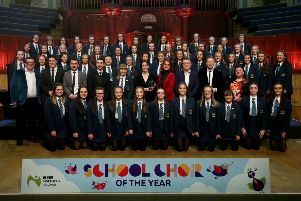 Soloist Melanie Johnston, whose singing has charmed many audiences throughout the province, is no stranger to the area as she taught music in Banbridge Academy and Laurelhill High School before setting up a growing home tutoring service for voice, theory and piano. Also on the programme is Brunswick Accordion Band from Annalong. Since it’s formation in 1958 the band have secured seven All Ireland Championship titles across various grades and were UK Intermediate Orchestra Championship runners up in 2001. Tickets for the concert priced £10 are available from any choir member.